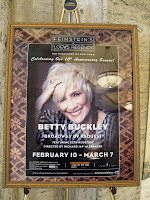 Betty threw in Over You from the movie Tender Mercies in her Broadway By Request show at Feinstein's tonight. She also sang On a Sunday. And when she sang Serenity, she apologized for singing it so loudly in a such small room. No microphone. Are you kidding me? It was amazing. I love you, Betty. I don't care that we've spent $1000s of dollars because of you.